This 13.1: CRUSH half-marathon program is designed for experienced halfers looking to nail a killer time. This is not a beginner program; it will challenge you in all the right ways, but you need to be ready. What constitutes being ready to CRUSH? Glad you asked. You can currently run at least eight miles and have been injury-free for at least six months. You also need to be able to devote enough time to running and strength training and foam rolling, so if you’ve got another life event happening— a move, a new position, a relationship status change—this might not be the optimal time to CRUSH. All that said, if you’re up for it and you follow the plan, you’re going to be thrilled with how strong and accomplished you feel on race day. THE PREREQS: An injury-free body is critical for revving your jets in this program, and experience running a couple of recent half-marathons is important. You should have an established base of consistent, injury-free running for at least the past 6 months, and be able to complete an 8-mile run pretty easily. It also helps to have been intimate with more demanding workouts, such as tempo runs or hill repeats, although we’ll help you through those. LONGEST LONG RUN DISTANCES: One 13-miler, three 14-milers, two 15-milers. CROSS TRAINING + STRENGTH TRAINING INCLUDED? Yes. 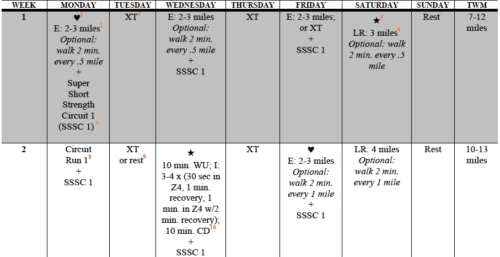 Most weeks have the option to cross-train one to two times, and most weeks also have three strength circuits, as well as a prehab routine Coach Amanda designed. Two of the strength routines include resistance bands. WEEKLY OVERVIEW: Four to five runs; one to two cross-training days; three strength circuits; one rest day. NUMBER OF RUNS WEEKLY: Four or five. A mother-runner-friendly training plan. We won’t lie: This is a 15-week program that demands your time, energy, and mental focus. You need to be well-trained and injury-free to consider it. If that’s you, great! You’ll challenge yourself on 13.1 CRUSH, and, in doing so, set yourself up for a race day like no other. Accountability—and camaraderie—galore. In addition to Train Like a Mother Club, you’ll also be invited to join a private Half-Marathon Challenge club on Strava, where you can track your miles, and a private Half-Marathon Challenge Facebook page, where you’ll quickly find an army of (funny, empathetic, inspiring) #motherruner teammates. You’ll share training tips, stories of good runs and bad, cheer each other on, and push each other out the door. Momentum comes from teamwork, and these Challenges roll on some serious #motherrunner momentum. We won’t lie: This is a 15 -week program that demands your time, energy, and mental focus. You need to be well-trained and injury-free to consider it. If that’s you, great! You’ll challenge yourself on 13.1: CRUSH, and, in doing so, set yourself up for a race day like no other. You’ll go 35 miles in your peak week, and rack up five training runs longer than 13.1 miles. If that sounds like too much, consider 13.1 RACE. No. The fee is for the 15-week comprehensive training plan, unlimited support, miles of resources, exclusive podcasts, and swag package, which will help you nail your marathon, both physically and mentally. At the end of the wave, you will participate in the organized marathon of your choice; you can also choose to run a half-marathon on your own, if that works better for you.